Mass Effect Paragon Lost Blu-ray Review. In the end, Mass Effect Paragon Lost is an entertaining journey into the Mass Effect universe and gives fans of this series a snapshot into another section of this colourful and exciting universe. 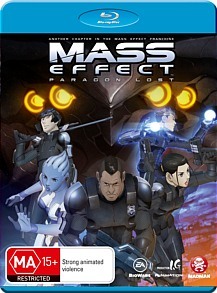 The highly anticipated anime inspired story of Mass Effect has arrived on Blu-ray and DVD. Mass Effect Paragon Lost that revolves around James Vega (Freddie Prinze Jr.), an Alliance Marine who comes face to face with the dangerous Collectors, an unknown and deadly alien threat. As the story is firmly based in the Mass Effect universe, it actually serves as a great filler between the games Mass Effect and Mass Effect 2, even though those who have played the last game may think otherwise. Even so, it's an interesting glimpse into this popular gaming franchise. Although Vega is the protagonist in Paragon Lost, he is definitely no Shepherd as he leads an assorted group of individuals to investigate this threat. Fortunately the references to the Mass Effect universe more than make up for the lack of this characters heroics. As Vega leads his Alliance Special Forces squad into the fray, there are also some other interesting characters from this universe that include a nefarious undercover Ceberus Agent (Vic Mignogna) and an Asari (Monica Rial) as they explore the fringes of this uniuvers. The highlight of Mass Effect Paragon Lost is the characterisation, intrigue and action sequences that after watching this movie really make you want to head back and play the Mass Effect series again. At times, the story feels a little too filler in some places, the cameos and themes of the Mass Effect universe assist Paragon Lost in filling a bridge between the two games which features some great stylised animation. On Blu-ray, colours are vibrant and images almost jump out of the screen. Audio supports Dolby TrueHD 5.1which enhances the battle scenes, especially when the weapon fire commences. There are also a handful of interesting special features with the highlight being a documentary entitled Directing Effect which goes into the creation of Paragon Lost with great references to the game. Add in another documentary entitled An Inside Look at the Mass Effect Universe which goes more into the game universe and last but not least All Doors open: A Look Inside Electronic Arts which although is not related to Mass Effect, it gives the viewer a sneak peak into Dead Space and the Sims. There is also a short trailer of Paragon Lost. In the end, Mass Effect Paragon Lost is an entertaining journey into the Mass Effect universe and gives fans of this series a snapshot into another section of this colourful and exciting universe. The only drawn back to this film is that I would have preferred to see Shepherd as the protagonist opposed to Lt. James Vega. It's still worth a watch or two!